The Hotshots just weeks earlier. the City of Prescott Fire Department, were killed on June 30, 2013 while fighting the Yarnell Hill Fire. It was the deadliest wildfire ever in Arizona, and the greatest LODD of firefighters since the attacks of Sept. 11, 2001. At 5:36 p.m. on June 28, lightning ignited a wildfire on BLM lands near Yarnell, Arizona, a town of approximately 650 residents about eighty miles northwest of Phoenix. On June 30, strong winds reaching more than 22 mph pushed the fire from 300 acres to over 2,000 acres. A long-term drought affecting the area contributed to the fire’s rapid spread and erratic behavior, as did temperatures of 101 °F. The area was thick with vegetation that hadn’t burned in 50 years. 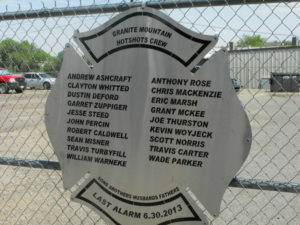 The Granite Mountain Hotshots deployed on June 30, to what at least one member thought was a “nothing” fire. For reasons that remain uncertain, the Hotshots moved from a burned-over section where they were safe — known as “the black” — and headed for another safe area, a ranch that had also been burned over. Minutes later, unit Supervisor Eric Marsh radioed that their escape route had been cut off and they were preparing to get into their fire shelters. That was the last time anyone heard from them. The firefighters had deployed the fire shelters, but not all of the bodies were found inside them. All 19 were burned to death. The lone survivor from the 20-man crew was 21-year-old Brendan McDonough. He had been serving as a lookout when the fire threatened to overrun his position. McDonough was about to deploy his safety shelter when he was rescued by Brian Frisby, the Superintendent of the Blue Ridge Hotshots, who was monitoring the radio communications between McDonough and the Granite Mountain crew. Frisby and McDonough moved the crew’s vehicles to a safer location, which they were doing at the time of Granite Mountain crew entrapment. 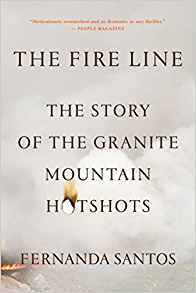 After moving the vehicles, Frisby and other members of the Blue Ridge Hotshots attempted to rescue the entrapped Granite Mountain Hotshots but were forced back by the intense flames and heat of the fire. On July 2, 2013 more than 3,000 people attended a public memorial service at an indoor stadium. in Prescott Valley. Vice President Joe Biden, Arizona Governor Jan Brewer, and McDonough, spoke at a memorial in Prescott on Tuesday, July 9, 2013. 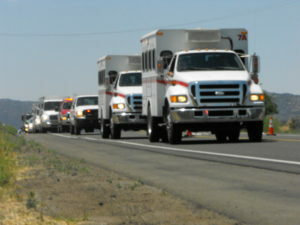 That memorial was attended by thousands, including representatives from over 100 hotshot crews across the country. Following a three-month investigation, the state’s Forestry Division released a report on September 28, 2013 which found no evidence of negligence or recklessness in the deaths of the 19 firefighters, and revealed that an airtanker carrying flame retardant was directly overhead as the firefighters died. The investigation did find some problems with radio communications. Order The Fire Line On December 4, 2013, the Industrial Commission of Arizona, which oversees workplace safety, blamed the state’s Forestry Division for the deaths of the 19 firefighters, based on an investigation by the state’s Division of Occupational Safety and Health. The Commission said that state fire officials knowingly put protection of property ahead of safety and should have pulled crews out earlier. The commission levied a $559,000 fine. 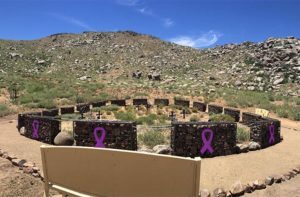 In November 2016, work was completed on the Granite Mountain Hotshots Memorial State Park. Near Yarnell, it includes the site where they died. Since it opened, the small parking area has been filled to capacity practically every day with people who are willing to make the seven-mile hike into the site where 19 heroes died on a summer afternoon. 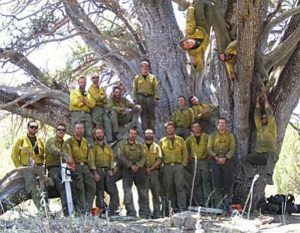 Prescott’s Granite Mountain Interagency Hotshot Crew was disbanded. A major Hollywood film, titled “Granite Mountain,” is set for release in October, 2017.